Miles "Tails" Prower - Concept: "Mobius"
Description: While in locomotion, Tails can curl down and take on a fetal position, rolling along the ground as a ball at a very high speed and rate of torque, meant primarily for breaking through barriers, or destroying enemies. Description: Also referred to as the "spinball jump," Tails is able to leap into the air and curl into a spinning, tightly compacted ball of destruction which can destroy enemies and break barriers. Description: Originally named the "Super Spin Dash," Tails is able to curl down and begin revving up, taking on a diagonally pivoted, ovular shape. Once unleashed, Tails blasts forward in an acceleration roll of high speeds with limited airborne capability, meant to break barriers or mow down enemies. It seems that either Tails learned this move from Sonic, or vice versa. Description: Tails puts his twin tails to good offensive use by swinging them at an enemy. Description: Tails twirls around like a top, gracefully shredding any unlucky foliage or robots in his path. He usually needs the Rhythm Badge to accomplish this feat. Description: While in flight formation, Tails surrounds his teammates with electricity and launches them at enemies to stun or destroy them, with enough power. (1). Like his nickname suggests, Tails has been bequeathed with the gift of not one, but two large, fluffy tails. He takes this genetic abnormality to his advantage, as he is able to use his two tails as rotary blades to fly like a helicopter at speeds that can impress even Sonic! His nicknamesakes are also used to supply an extra boost of speed, enabling Tails to sail across the ground using his tails as a rear propeller. Thanks to this talent, he stands a considerable chance in a race against Sonic or Shadow. He can also use his tails for defensive and offensive purposes, since one quick swipe of them packs enough speed and force to slice weeds in two or puncture Eggman's robots. However, if he uses them in flight mode for too long, he gets fatigued after a while. (1). Extremely talented and clever mechanic, rivaling Dr. Robotnik. (2). Excellent piloting, aerial dogfighting and driving skills. (3). Satisfactory skills at sports like boarding and grinding, which he probably learned from Sonic. (4). Has much skill with using and tuning up a variety of Extreme Gear. He knew how to ride them before Sonic did, in fact. (5). Can read and translate Binary and Hexadecimal language. (1). Astraphobic. Tails is dreadfully scared of lightning and thunder. (2). His intellect gives him the stereotypically bad habit of blabbering on and talking too much. Needless to say, this trait sometimes irritates Sonic and others to the point where they start ignoring him. To make things worse, this can ruin a perfectly laid plan if he does not watch it. (3). A bit too humble to realize his potential. (4). Sometimes has issues with self-confidence, as Tails is often faced with a dilemma of being unable to easily step out of Sonic's shadow. This gets even worse if he feels he has failed Sonic in any way. (5). Tends to be really snarky and vindictive when feeling particularly underappreciated or having a REALLY bad day. - A pair of grey and white goggles with blue lenses. Curiously, they're never seen over his eyes when riding Extreme Gear. Description: Self-made metal jets that go on the ankles of Tails' shoes. These provide thrust and allow him to fly farther. Description: A green and purple badge with three ribbons that fastens to Tails' chest. It let Tails perform the Rapid Tails Attack. Description: Fake power rings that Tails uses to either incapacitate, damage or destroy his enemies when need be. They can be used separately or as bombs. (4). The Blacksmith of Camelot Castle, despite his profession, only wielded a simple slingshot as his weapon. He made up for its initial weakness by firing small bombs. Description: A portable handheld touchscreen computer that serves a variety of functions including radar, global map, alien language translator and long-distance video communicator. Description: A yellow formula racer Tails used in the Chaos Grand Prix racing circuit. It had quite a good cornering ability but was offset by a low top speed. Description: Tails' personal submarine and arguably his very first prominent invention of note, as it was created before the boy met Sonic. The Sea Fox has a wide hull (it's either angular or curved depending on the game it is featured in) and blue and orange color scheme and seats one. In terms of weaponry, it sports a large drill on the front, has a built in rocket launcher and a choice of upgrades at Tails' disposal: a rapid fire Vulcan gun, Mirror Armor for temporary invincibility, a Jet Screw for short leaps, a Rocket for flight, anti-aircraft missiles, mines, and a powerful electrical field. Description: A blue and yellow biplane that is an upgraded version of Sonic's Tornado. The Tornado 2 outstrips the original Tornado in terms of speed as it has a mode in which the plane transforms into a sleeker form with its four wings resembling an 'X' when viewed from the front. Unfortunately due to oversight on Tails' part, it has no landing gear in this mode. At first, it required a Chaos Emerald to be operational. Nowadays, it does not, though its current power source is unknown. Description: A blue and yellow biplane that is an upgraded version of Sonic's Tornado and the Tornado 2. The Tornado III, like the Tornado 2, utilizes several mode changes ranging from a jet mode, walker mode (known as the Cyclone), and automobile mode. The Tornado III has quite a few armaments in Cyclone walker mode, such as a missile blaster that shoots homing missiles upon successful lock-on with its red laser, a pair of hover boosters on its 'feet' that allow it to hover in walker mode and a Vulcan cannon that shoots missiles powerful enough to break wooden and metal containers. Description: An orange and yellow Extreme Gear air board that Tails used to make it to the finals of the EX World Grand Prix. The Yellow Tail has a great cornering ability. Tails later rebuilt it from the ground up with transformable morphing metal. Description: Also called the Tornado 03 - A red and yellow biplane that is a combination of the previous Tornadoes in terms of design and technological capabilities. It retains the former paintjob and design of Sonic's Tornado and the jet mode of the Tornado 2. It also has a rear gunner for Sonic to fire from. Ever since he first met Sonic, Tails has always strived hard to somehow replicate the admirable mannerisms of his best buddy in blue. Tails is a very loyal, docile and sweet-natured fox with a huge knack for building or tinkering with machines. His clever mechanical skills rival that of Eggman's, but Tails never thought of it as such a big deal, thus not realizing his true potential. But in the more recent times, he has tried becoming more independent and just as confident as Sonic when he gets his moment in the spotlight as a hero. Although he works hard to impress Sonic, his true blue friend already knows that Tails' awesome gadgets and positive attitude have always been a huge help for him all this time, as the two have formed an Unbreakable Bond. Tails eventually came to the conclusion that it was determination he needed, and once that was realized, it made him quite the motivated little fox. If Tails is set on a goal, he can accomplish it. And there is absolutely no doubt that such a gesture impresses Sonic a lot, as the hedgehog never misses an opportunity to compliment, encourage and depend on his surrogate little brother. On the negative side, being around Sonic so much has rubbed off on him a bit, as Tails' more recent appearances have shown the little guy with more than his fair share of snark, especially when in a bad mood, as his insecurities start to show if he's feeling underappreciated. Regardless, the little guy has come a long way, and is grown more comfortable with himself with every achievement. Oh, and don't even think about killing Sonic. Tails will NOT let you get away it...sometimes. Like Sonic, Tails' history is just as blurry. Before Tails even met Sonic, the fox resided on a far south island called Cocoa Island, where his house happened to also be his workshop where he always spent his time building new things. Later, the Imperial Battle Kukku invaded Cocoa Island with his army in search of the Chaos Emeralds that were there at the time, wanting to exploit their infinite powers to take over the world. Tails managed to stop the Battle Kukku and liberate the island from his tyranny, but before that, Tails' history is unconfirmed. It wasn't until a bit later that Tails actually met Sonic at the mysterious Westside Island, the Island of Illusion. Sonic had landed there indeliberately as a result of engine problems within his antique biplane, the Tornado. With little to go on in terms of repairs, he decided to zoom around his new surroundings. During this time, Tails was walking about, depressed for some reason and lonely as hell. He was brought out of this by a swift blue blur, namely Sonic. When Tails recovered from the shock, he, as if by instinct, quickly took off after this cool newcomer, dead set to keep up as best he could. After being followed for a while, Sonic noticed he was being watched by the shy little fox. At first, Tails was hesitant to come out and introduce himself, but not long after, they became quick friends since Sonic was impressed by Tails' determination to keep up and follow along. But what Tails was even more impressed with was Sonic's plane, the Tornado. Moments after seeing it, he was awed by its appearance and properties. During their consolidated effort to stop Dr. Robotnik's forces on Westside Island, Tails in fact, made several improvements to the Tornado to help aid Sonic through his adventures, assuming co-ownership of the biplane he loved so much. Since then, Sonic & Tails have always been a dynamic duo when it came to stopping Eggman's devious plots, a relationship viewed by Sonic as a delightful brotherly relationship. And Tails has remained as loyal as can be to Sonic, yearning to be one the hedgehog can truly rely on. These days, Tails has steadily begun to break free of the (unintentional) mental stranglehold that Sonic's authority and fame had over him. That shouldn't be too difficult with his awesome mechanical know-how that has helped Sonic on frequent occasions. Family: Sonic the Hedgehog is like a big brother to him. His parentage is unknown. Greatest Friend(s): Knuckles the Echidna, Amy Rose, Cream the Rabbit & Cheese and Professor Pickle. Other Friend(s): Big the Cat, Vector the Crocodile, Espio the Chameleon, Charmy Bee, Shadow the Hedgehog, Rouge the Bat, Blaze the Cat, Silver the Hedgehog (when the guy's actually friendly), Marine the Raccoon, and the Wisp race of aliens. Rival(s): Dr. Ivo "Eggman" Robotnik and Wave the Swallow (as far as Extreme Gear is concerned). Foe(s): Most of the time, anybody who is Sonic's enemy is an enemy of Tails' as well; particularly Eggman. Eggman Nega as well. Likes: Tinkering with machines, Christmas, venturing the globe with Sonic, and flying. Main Dislikes: If anything, Tails hates boredom or feeling useless. This is usually why, when he isn't hanging out with Sonic, he spends his time working on and/or building machines or flying around the world. There usually isn't any time you'll be able to see this little fox where he ISN'T doing something, whether it be recreational or mandatory. Other Dislikes: He also dislikes thunder and lightning. Nobody knows why, probably because thunder and lightning is the pilot's worse nightmare. Having his mechanical skills dissed pisses him off as well. Finally, he hates being ignored, something Sonic's apparently done more than once. Favorite Color(s): Unknown. Could be blue or yellow - or possibly red when considering how much he liked the Tornado. Occupation: Unemployed. Too young, anyway. Place of Residence: Unknown. Probably his workshop he built in the Mystic Ruins/to the west of Water Palace. Or his house in Emerald Town. Original Purpose: Best friend and/or sidekick of Sonic the Hedgehog; boy genius of the cast. Date of first promotion/presence in the industry: Tails was first promoted in the first video game he made an appearance in. And surprisingly, it's not Sonic 2 on the Genesis/Mega Drive. Tails actually made his first appearance in Sonic the Hedgehog 2 for the Sega Master System/Game Gear a month before Sonic 2 for the Genesis was released. He was not playable. People still consider Tails' official release to be Sonic 2 for the Genesis, which was November 21st, 1992. Impact on Series: Tails is a prominent character. He's generally appreciated and he and Sonic have made it to many "Best Video Game Duo" lists together. As of late, however, he's drawn ire for seeming to be the start of an irritating and useless cast increase that has only ceased very recently. Thus, critics would like nothing more than to see him, and everyone who was introduced after him, gone forever. Design Process: Tails' design process was similar to Sonic's, since it went on in the form of a competition between Sonic Team. Yasushi Yamaguchi's illustration of a young fox with two tails won the hearts of the team. Tails was actually meant to be named just Tails. But Yamaguchi managed to sneak the name Miles (the name he gave the fox, and the name he liked more) into a lot of graphics in the Sonic 2 video game, and in the end, got things his way as they named the character Miles "Tails" Prower. Possible Design Inspirations: Tails' most well-known design inspiration is the Kitsune, a creature of Japanese lore. It is a fox with multiple tails, to put it simply. Every century, a Kitsune grows a new tail to showcase its power and authority. 9 is the maximum a kitsune can get. 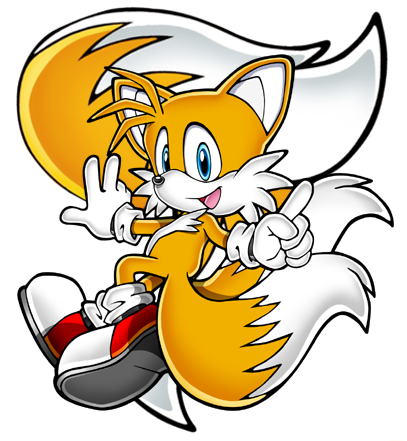 This multiple tails issue obviously heeds evidence that this is what inspired Tails' namesake of a genetic abnormality. Thankfully, Tails did not inherit the other well-known trait of a kitsune: their penchant for random (and usually cruel) pranks. Another possible design inspiration of Tails is the popular literature excerpt by Isaiah Berlin written in 1953, The Hedgehog and the Fox. The basis of his essay was an old Greek philosophical saying, "The Fox knows many things, but the Hedgehog knows one big thing." The essay is meant to draw a distinction between thinkers who contribute a number of valuable but unrelated insights, and those who develop a unified vision or a universal principle. This could be responsible not only for the fact that they chose Tails' as a FOX, but for Tails' personality: he is a smart thinker and he knows many things, but is also known to blabber on about perceptible and particularly unimportant topics, as opposed to how Sonic usually concentrates on one motive. This second part is unlikely, but it's just something we thought of. Tails has been around almost as long as his hero, Sonic. The notoriety, however, is mixed. On the plus side, he's proved his worth as a sidekick and as a hero of his own merit more than once and he's got more than his share of fans. Not only that, but he's received a starring role in not one, but two games. Neither Knuckles nor Shadow can claim that. Tails represents the classic young ward that wants to be like his hero. He looks up to Sonic and wants to be as fast, cool and famous as him. Nowadays, this motivation is still present, but he's focused more on his impressive knack for inventing. This, coupled with his own natural abilities, has made him a hero of his own right, to the point where busting metal heads with Sonic has become an exciting routine for him. On the negative side, the cast has only gotten bigger and bigger since he showed up, and critics, in hindsight, hate him for that. Also, it seems that very few people can tolerate him in his debut to begin with, since he follows Sonic around constantly. For many, he was simply in the way, particularly during the more difficult Special Stages. I, for one, rarely had any issues with the little guy. I've enjoyed his addition and am glad he's still around. He's really come into his own as of late and has gained a great deal of confidence in himself (perhaps too much). One can only look forward to what he's got planned next...if the writers can get him right, anyway.